Home related settings are at AppearanceTheme SettingsHome. 1. 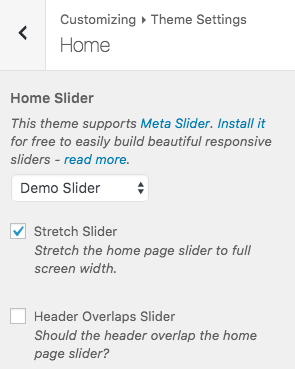 Install Meta Slider plugin. 2. Go to Meta Slider and create a slider. 3. Go back to AppearanceCustomizeTheme SettingsHome and select your slider from the drop down list. For a complete tutorial on this process, please see the documentation page: Meta Slider: Home Page and Page Slider. * Please note that the demo slider is unfortunately not editable. Enable this setting to stretch your slider to full-width. Alternatively, leave this setting disabled and use the 100% width setting at Meta SliderAdvanced. The Advanced tab is found in the right column when editing a Meta Slider. Using the Ultra stretch setting will maintain your slider height. Depending on the width of your image, it might cause slight zooming. The Meta Slider 100% width alternative won’t cause any zooming but also won’t maintain your slider height setting. With this setting enabled your header will be assigned an opacity of 90% and will overlap the slider.